I want to make a 32 DP #4 cutter 14 1/2 pressure angle. I have the book Gears & Gear Cutting by Ivan Law. & for the 20 deg.is .320 so would it be right to use .313 for the 14 1/2 deg.. The 14 1/2 should be a smaller diameter than the 20 deg. 32 dp x 20 pa is .023 that is .007 so that is what i took off of the 20 deg. disk. When you get a chance, please post an introduction in the introduce yourself section. I am cutting a 8 tooth 60 deg. & a 16 tooth 30 deg. helical gears. The limit is 12 teeth with a standard cutter. The 8 tooth will have to be done on a gear cutting machine. Sorry to come to this discussion a bit late, I've been away from regular internet access. Are you aware that in order to mill a 60 degree 32 DP helical gear you need 64 DP gear cutter (DP / Cos (a) - where a is the helix angle) and for the 30 degree gear you will need a 36.95 DP cutter? For the first gear you will need a cutter for 64 teeth and for the second gear a cutter for 25 teeth. Machinery's Handbook explains the calculations for milling helical gears. For spur gears, increasing the pressure angle to 30 degrees will decrease undercutting of the tooth and allow you to make usable gears with smaller numbers of teeth. I believe you can use standard 32DP cutters for your gears. You apparently already know what number of cutters you need? And, contrary to what Jo says, for helical gears, you can go quite a bit below 12 teeth depending on the helical angle. I made 6 tooth helical gear using a standard cutter, although I don't remember which number it used. Hope this is what you need. Took me a while to find out where on my computer I'd hidden it, and longer to find out how to post it. The normal pitch is the distance between adjacent teeth at right angles to the tooth - as the helix angle increases this distance gets less and hence the cutter must be thinner than would be used on a spur gear. Since we are using a disc cutter to machine the helix this tends to thin the teeth even more either side of the contact point, which is why the diameter of the cutter is one of the factors which needs to taken into account when choosing which number cutter to use. I guess all this is why these gears should really be hobbed. In the case of 45 degree gears we can use a pair of cutters from the same set. In this case, using 32DP cutters would produce a pair of 22.6 DP gears. I think we are fortunate that we only need our gears to maintain timing of the cam shaft, so questions of noise and power loss from less than perfect gears are of little consequence. Our home made gears seem to work well enough for our purposes. Don, however is quite specific about the gears he wishes to make. My helical gear cutting adventures were hampered the maximum lead I can arrange with the change gears on my lathe. Your helical fixture will remove that limitation . I ought to add that I have submitted an article on this subject to Model Engineer. I am not sure if it will be published, the editor has some concerns on whether the subject matter is too abstruse. 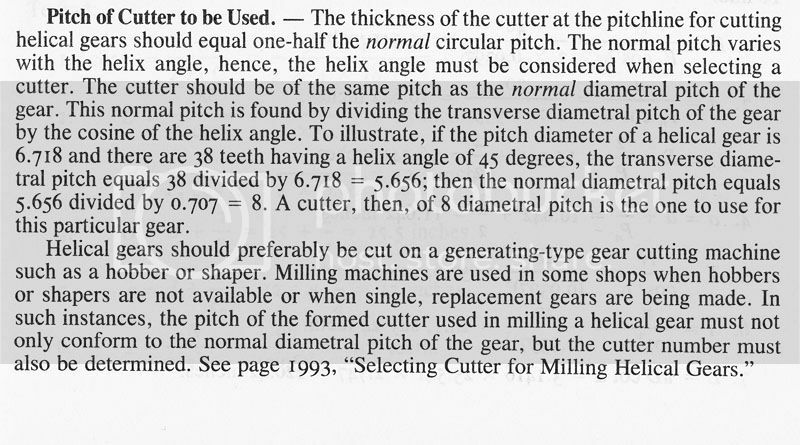 My understanding is that if you use 32DP cutters, the normal pitch will be 32DP, but the transverse pitch, which is what you see if looking at the side of the gear, will be some odd number. Please accept my apologies and disregard my posts.